California Vacation Planning > > California Travel Ideas Blog > Blog for Los Angeles > Happy 75th Union Station! When Union Station in downtown Los Angeles opened on May 3, 1939, the city hosted a three-day celebration that included a parade attended by 500,000 people. While Union Station’s 75th Anniversary celebration may not draw half a million, the city’s nearly 10M current residents will join – at least in spirit – to thank this beloved Los Angeles transportation hub for its past service and to wish it well in the future. If you plan to be part of the anniversary festivities or visit to Union Station sometime on your own in the future, you may want to print out these handy pdf Union Station floor maps (here and here) and/or this excellent, free printable Union Station guide made available by the good folks at AngelsWalksLA. If your timing is right, you’re in luck. The LA Conservancy conducts Union Station tours on various Saturdays, and their tours are by and large excellent. Additionally, Metro is hosting special Union Station tours on Tuesday evenings (5:30-7:30) and on Sunday mornings (10:30-12:30) during the month of May 2014 in conjunction with the 75th Anniversary celebration. You will also want to follow this Metro link if you are interested in Metro’s innovation Art Tours that combine travel on their train lines with an appreciation for the public art that resides in a various line’s stations. What a cool idea, and it’s available year-round. You even get a free TAP Metro on-day card ($5 value) at the end of the tour! If you decide to visit and explore Union Station on your own, please make sure you read and obey all signs. Keep in mind that there are areas you will not have access to, some of which you might be able to enter on an organized tour. Famous LA muralist Richard Wyatt’s 80-foot long “City of Dreams/River of History” in the East Portal. The best time to see it is near the end of the day, when light pours in through the stunning geometrically-patterned, cut-glass atrium above. That counts as two, I guess. The South Patio – also known as “the arrivals patio” – where so many people over the years first experienced Los Angeles, some of whom went on to great fame and fortune in the fair city. The area has been restored to look much as it did 75 years ago. Palms, pepper trees and bird of paradise bushes conspire and invite you to come explore the Southern California landscape beyond. A 1996 public art installation called “Atrain” that was created by Bill Bell is located near the top of the escalator to the Red Line. There you will find 12 vertical slits on the wall. If you stand to the side of the escalator and watch the vertical lines as the trains pass, all you will see at first is flashing lights. If you move your head along with the train, however, you will start seeing faces and pictures and words through those vertical lines. It’s quite fascinating, and you can see some photos of it here. MANY others have filmed over the years at Los Angeles Union Station. 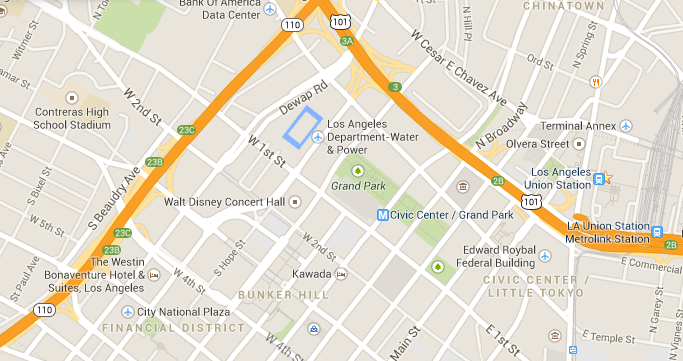 In the Google Maps screenshot below, you can see how today’s Chinatown, Olvera Street, Union Station and Little Tokyo are positioned in a line, north to south, as well as how Union Station is positioned in relation to other downtown Los Angeles attractions like City Hall (near Grand Park) and the Walt Disney Concert Center. Just below where this map cuts off at LA’s Financial District is where you’ll find Staples Center and the LALive entertainment complex. 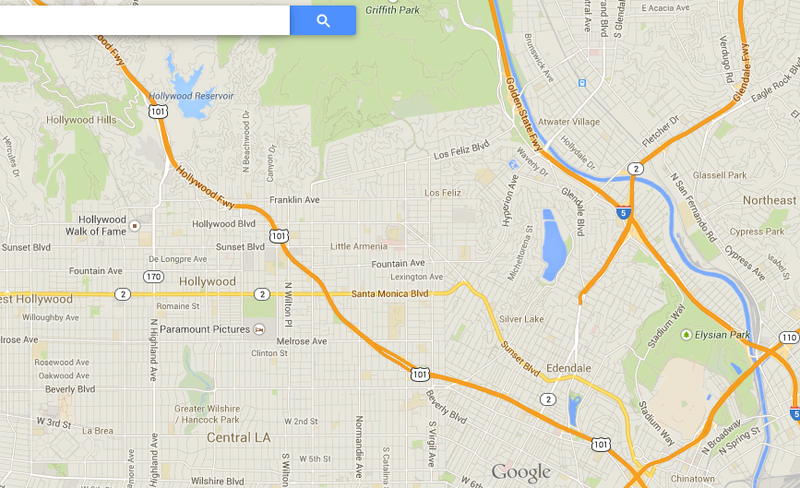 This Google Maps screenshot shows Chinatown’s location (at the bottom of the map) in relation to other popular LA tourist destinations, like Hollywood and Griffith Park. To learn about other Los Angeles Tourist Attractions, please read our article here (link opens in a new window). The father-and-son team of John Parkinson and Donald B. Parkinson (with assistance from others, including famous architect Jan van der Linden) designed the building in a striking combination of Neo-Colonial (Revival and Mission styles) and Art Deco (Streamline Moderne) design. The father-son team also contributed City Hall and the Bullock’s Wilshire buildings to LA’s fascinating architectural history. It’s the largest railroad passenger terminal in the western U.S. and given its relative youth in comparison to the other Union Stations scattered around the country, it’s considered “the last of the great American train stations.” And it is, truly, a wonderful building. Union Station was built just across the street from bustling Olvera Street, the site of a festive Mexican Marketplace since 1930, which sits near the original site where 44 mixed-heritage settlers (Native American, African and European) began a farming community in 1781 after traveling 1000 miles through northern Mexico to arrive at El Pueblo de Nuestra Señora la Reina de los Ángeles (the Town of Our Lady Queen of the Angels). From this humble beginning grew the Los Angeles we know and (mostly) love today. When city voters narrowly passed the measure that funded the building of Union Station, the property on which it was planned was a thriving Chinatown community. Court cases ensured, but the community was displaced and a new Chinatown began nearby. That Chinatown community exists today, as does the historic Los Angeles Japanese community known as Little Tokyo, also near Union Station. After a period of decline in the auto-centric last half of the 20th century, Union Station now once again buzzes with activity as a hub for both long distance and commuter rail and bus travel to and around the Los Angeles area. The station serves multiple transportation providers offering local, regional and long distance service. Beginning in 2014, Metro is embarking on a new master plan to guide improvements at Union Station and the surrounding site as an expanded transit hub. MTA executives hope to preserve the historical structure while rerouting bus traffic for efficiency, adding a retail space component and, eventually, allowing for the arrival of a bullet-train connection to San Francisco (currently targeted for around 2030). Ken Pratt, Union Station’s director of property management, told the LATimes “some inventive, eclectic, well-heeled restaurateur is going to come in here and do something marvelous” at the already marvelous and long empty old Harvey House restaurant at Union Station. That article is dated November 2013, and the timeframe Pratt provides is “within 18 months.” We can’t wait. It’s a beautiful space!